Tablewar along with Frontline Gaming has a Kickstarter underway for their new MegaMat. 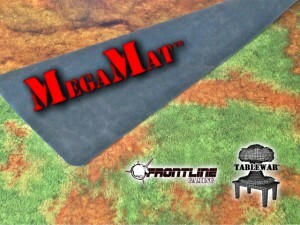 MegaMat™; a series of themed, full color 4’x6’ (and 4x4’ with stretch goals) tabletop gaming mats that don't crease and resist stains, ready to play out of the box. The first two MegaMat™ design prototypes--Grassy Plains and Blast Zone--are done and in our hands! We have plans to unlock Urban, Snow, and Desert themed MegaMat™ designs in 4x6' and 4x4' sizes with stretch goals!